Zinc Oxide Overdose is the accidental or intentional intake of compounds containing zinc oxide. What is Zinc Oxide Overdose? What are the Causes of Zinc Oxide Overdose? It is available in the form of moisturizing and sunscreen lotions, cosmetic creams and ointments, and food additives. It is also used in rubber products, sealants and adhesives, paint coatings, cigarette filters, etc. What are the Signs and Symptoms of Zinc Oxide Overdose? Note: Breathing-in toxic fumes of zinc oxide products, which generally occurs in an industrial setting, can cause certain severe symptoms. This condition is known as metal fume fever. How is First Aid administered for Zinc Oxide Overdose? Who should administer First Aid for Zinc Oxide Overdose? First aid for Zinc Oxide Overdose is administered by healthcare professionals. What is the Prognosis of Zinc Oxide Overdose? Zinc Oxide Overdose is usually not a life-threatening condition and once symptoms are managed, the prognosis is good. The substance is not known to be very toxic or harmful. 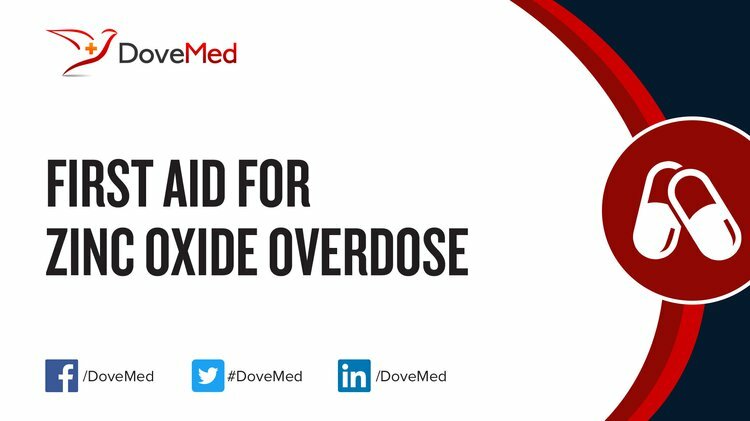 In general, overdoses are common situations in the emergency departments. Most of the cases are often not fatal, when appropriate treatment is given. How can Zinc Oxide Overdose be Prevented? Cho, W. S., Duffin, R., Howie, S. E., Scotton, C. J., Wallace, W. A., MacNee, W., ... & Donaldson, K. (2011). Progressive severe lung injury by zinc oxide nanoparticles; the role of Zn 2+ dissolution inside lysosomes. Particle and fibre toxicology, 8(1), 27. Li, C. H., Shen, C. C., Cheng, Y. W., Huang, S. H., Wu, C. C., Kao, C. C., ... & Kang, J. J. (2012). Organ biodistribution, clearance, and genotoxicity of orally administered zinc oxide nanoparticles in mice. Nanotoxicology, 6(7), 746-756. Adamcakova-Dodd, A., Stebounova, L. V., Kim, J. S., Vorrink, S. U., Ault, A. P., T O’Shaughnessy, P., ... & Thorne, P. S. (2014). Toxicity assessment of zinc oxide nanoparticles using sub-acute and sub-chronic murine inhalation models. Particle and fibre toxicology, 11(1), 15. Umrani, R. D., & Paknikar, K. M. (2014). Zinc oxide nanoparticles show antidiabetic activity in streptozotocin-induced Type 1 and 2 diabetic rats. Nanomedicine, 9(1), 89-104. Zmener, O., Lalis, R. M., Pameijer, C. H., Chaves, C., Kokubu, G., & Grana, D. (2012). Reaction of rat subcutaneous connective tissue to a mineral trioxide aggregate–based and a zinc oxide and eugenol sealer. Journal of endodontics, 38(9), 1233-1238. Zmener, O., Pameijer, C. H., Kokubu, G. A., & Grana, D. R. (2010). Subcutaneous connective tissue reaction to methacrylate resin–based and zinc oxide and eugenol sealers. Journal of endodontics, 36(9), 1574-1579. Janczyk, P., Kreuzer, S., Assmus, J., Nöckler, K., & Brockmann, G. A. (2013). No protective effects of high-dosage dietary zinc oxide on weaned pigs infected with Salmonella enterica serovar typhimurium DT104. Applied and environmental microbiology, 79(9), 2914-2921. Huang, K. L., Lee, Y. H., Chen, H. I., Liao, H. S., Chiang, B. L., & Cheng, T. J. (2015). Zinc oxide nanoparticles induce eosinophilic airway inflammation in mice. Journal of hazardous materials, 297, 304-312.